The Swan Brewery Cup returns to Perth for another year with the 62nd Skate National Champions Steve Hudson and Bodhi De Freitas. Steve and his grandson Bodhi of East Fremantle Yacht Club sailed their immaculate Skate 973 - On the Road Again - to a well deserved series win in variable conditions, just edging out last years champions Silvio Fico and Mick Minutillo, also from WA, on 936 - Gobstopper, with multiple Skate National Champion Dave Luck and crew Damien Vlotman of NSW coming third on 981 - Any Which Way. Ray Simpson and Trevor Green of NSW took out the Handicap trophy on 962 - Traction. 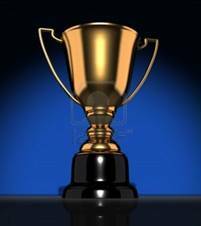 For details of all prizewinners plus more stories and photos from the titles Click Here. 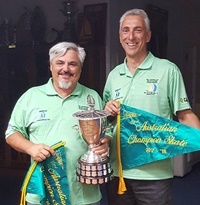 Popular Skate Legends Silvio Fico and Mick Minutillo of Western Australia are the 61st Skate National Champions. Racing their equally legendary Skate - 937 Gobstopper, the longtime skipper and crew combo were podium finishers in all seven Heats with one x win, five x 2nd places and one 3rd place. Runners-up by one point were Ken Davies and Lachlan Schroder of NSW on 969 - Natural Juices II. Brett Andrews and Laurie Parsons of WA on 986 - Getting Your End Wet rounded out the top rhree. Paul Shiner and Paul Annesbury of WA on 978 - Magasaurarse, took home the Handicap series trophy, while NSW legends Norm Ryan and Kevin Williams took home the Veterans Trophy. Details of all prizewinners plus more stories and photos from the titles can be found here. 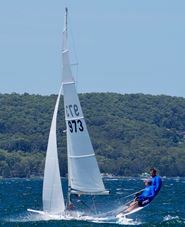 This is a site for everyone interested in sailing, supporting, or otherwise getting involved with the 14 foot Skate class, a proud 60 year tradition across three states in Australia. You'll also find us on Facebook - search on "Skate Sailing" or follow the link on this page. Please contact us if you have photographs, newspaper clippings, Skate titles programs or other memorabilia.